Commercial card magic at its best. All practical effects which you will use. COLOR CHANGE AGAIN (John Yeager): A color changing deck routine involving two selected cards. MATCHED PICTURE CARDS (Nick Trost): The picture cards are shuffled and magically they match up in pairs. DOORSTEP ACES (Paul Gordon): The four Aces find three selected cards. REPROCESSED ELIMINATION (J.K. Hartman): A selected card appears in an unexpected way. Very strong effect. RANDOM THOT (Karl Fulves): An impossible selected card revelation that will fool you too! JACKS IN THE BOX (Aldo Colombini): Red and black cards alternate and then Jacks in the Box appear. FUTURA (Aldo Colombini): An easy way to perform the classic “Between The Palms” trick. FOLLOW THE LEADER (George Sands): The name says it. 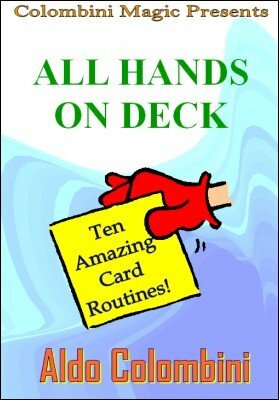 A great routine using four red and four black cards. A LOWER DEEP (Ryan Matney): Just four cards, but a lot of magic in three phases. DAZED (Peter Duffie): The most amazing version of the “Wild Card” in years!